Win A Night Stay at the W Chicago City Center! Win A Drybar Goodie Bag & Service! A Reserved Area On Us! Are you celebrating Your B-Day, Bachelorette Party, Bachelor Party, Graduation, or any other special occasion? Let us know and we’ll set you up VIP style on us! Just send us an e-mail with your name and how many guests there are in your party and we’ll take care of the rest. Limited amount available. E-mail us at chicagonyeparty@gmail.com w/ subject “Pre-NYE Celebration” to sign up. 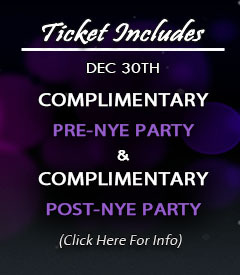 Note: To reserve a table for bottle service at the pre-nye party, please e-mail chicagonyeparty@gmail.com. Win a pair of tickets to NYE 2020 at the W Chicago City Center. Just “Like” us on Facebook!